Temperance sputtered and fumed, breathing fire as the door to Basil’s apartment staircase closed behind him. That no-good, self-centered a**! How dare he say their friendship had been destroyed by her ambition! If they’d truly been friends, he would have stood by her and championed her clever attempts to get her family moved westward. But once he introduced her to Jake, it was as if he’d turned his back on her. She could take him turning his back on her as a woman, but not as a friend. She yanked open the door and ran up the stairs. Oooh! 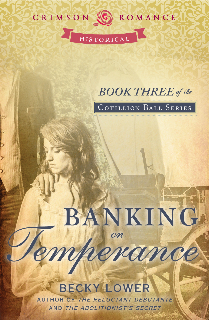 I love that Temperance became Temptress! Can't wait to read it, Becky! The heat between Temperance and Basil is definitely not temperate!! !